Frontdoors Magazine is dedicated to the memory of Mike Saucier. LET’S TALK PETS Terry Gross knows how to talk to people. As host and co-executive producer of NPR’s “Fresh Air,” she’s interviewed thousands of people over the course of her four-decade career. She says that “Tell me about yourself” is the only icebreaker you’ll ever need to navigate an uncomfortable dinner party or awkward conversation. wonder Cooney, a gifted communicator, prizes her dog’s artful ability to get his point across? Or that Hansen, who adopted Crosby, one of the puppies born in his home, is proud of his pooch’s resilience? My hunch is that talking about pets helps us learn what traits people value, and maybe what qualities people prize in themselves. With all due respect to Terry, I think I’ve improved on her formula. “Tell me about your pet” is my trick for getting people to let down their guard and speak from the heart. This issue is for everyone whose heart beats faster at the thought of puppy breath and kitten mews. 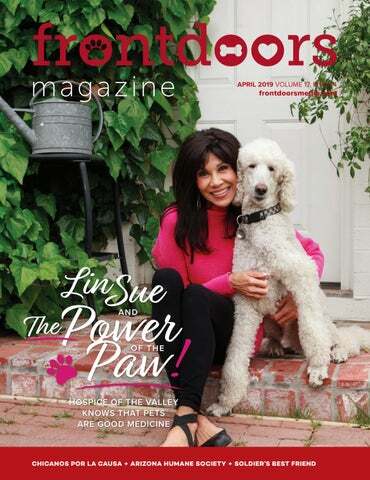 Along with our spotlight on Hospice of the Valley’s pet therapy program and the innovations at the Arizona Humane Society, we hope you’ll enjoy reading about Soldier’s Best Friend, Lost Our Home Pet Rescue, and many other organizations that help pets and people in crisis. Because it’s never just about the pets, is it? It’s about a desire to nurture, love and heal and the profound effect these relationships have on our lives. That’s why these organizations are so worth celebrating — and why it’s my honor to present this month’s issue. And if we’re both at an event sometime soon, please come find me and tell me all about your furry friends. stronger and healthier communities throughout the southwestern United States. For the past four years, Iâ&#x20AC;&#x2122;ve had the privilege and honor of leading an all-encompassing organization for the underserved. We empower lives by developing self-sufficiency through programs and services with the support of a team of 850 committed employees at approximately 115 locations in Arizona, Nevada and New Mexico. 2. What kind of work did CPLC do in its early days? ADAME: Our organization’s name “Chicano” represents our roots and refers to those who navigate both the Mexican and American worlds. This term became popular during the Civil Rights movement, when CPLC formed. “Por La Causa” translates to “for the Cause,” which at that time was combating discrimination. Since then, the term “Chicano” has expanded to include anyone who believes in equal opportunity for all people, regardless of background. Likewise, the term “the Cause” has also evolved and now represents CPLC’s ability to adapt and advocate on behalf of the community to meet changing needs. 3. Has CPLC’s purpose changed over the years? ADAME: Our purpose remains the same; however, based on the growing needs of the community, we have expanded in scope. We believe that we create the greatest impact by delivering programs in the following areas: economic development, education, health & human services, and housing. Over the last decade, we’ve expanded our services to Nevada and New Mexico and are exploring opportunities in other states and in Mexico. To support our mission of helping individuals become economically and politically empowered and self-sufficient, we lead by example. Unlike most nonprofits, CPLC owns and manages for-profit businesses, which helps sustain our charitable initiatives. the Latino community and have become the most trusted provider of services in the areas we serve. 5. What kind of issues does CPLC address? ADAME: Since we began more than 50 years ago, CPLC is committed to providing a hand up and not a handout — everything from helping someone buy their first home or start their own business. We provide a holistic approach to the health of the individual and to early childhood development. Mainly we serve as an advocate as the voice of the Latino community and those underserved populations. 6. How is CPLC moving the needle in your four impact areas? MOYA: An economic survey demonstrated that CPLC has contributed $1.75 billion to Arizona’s economy from 2006 to 2016. The economic impact to the state includes $534.7 million in housing and real estate, $398.4 million in economic development, and $817.7 million derived from health & human services, education and corporate services. Moreover, CPLC’s presence in Arizona over the past 10 years has generated more than $56 million in tax revenue, strengthened more than 300 small businesses through lending, and generated $85 million in construction revenue. 7. How many people does CPLC serve, and in what populations? MOYA: In the past six years, CPLC has impacted 1.4 million lives, equivalent to the population of Phoenix. In fact, CPLC impacts the lives of more than 306,000 individuals annually in Arizona, Nevada and New Mexico. we all live. It also means having the trust of the community to be the leader to help bring about that impactful change. 9. What do you see for CPLC in the next 50 years? MOYA: To continue to grow in the role of the largest community development corporation in the entire Southwest by expanding our services in Nevada, New Mexico, Texas and California to reach our goal of impacting 1.5 million lives within seven years. But I would be remiss if I didn’t give credit where credit is due by thanking those who had the foresight and grit to start Chicanos Por La Causa. It was because they saw inequalities in the education they were receiving and wanted to change that in a positive way. I wonder if they had any idea that what they were doing then would grow into what CPLC is today. 10. How can readers support the work CPLC is doing? MOYA: They can join our events, sponsor, engage, volunteer or donate in celebration of our 50th anniversary. CPLC has scheduled a series of events throughout 2019. The signature event in Phoenix is the 50th Anniversary Dinner & Awards “Here We Stand,” where CPLC will honor Arte and Carole Moreno, Sheila E., and Pete Escobedo, who are trailblazers that have broken barriers in sports, music, the arts and philanthropy. The celebration will include an exhibit of historical photographs and a free public concert with renowned artist Sheila E. on April 27 at the Phoenix Convention Center. To learn more, go to cplc.org. All three of Dr. Steve Hansen’s family dogs came from the Arizona Humane Society. He is shown here with his dog Sammi. to completely change the complexion for animal welfare in our organization and in the Valley as well.” AHS’s role is to care for the most vulnerable — the sick, injured, homeless and abused animals often overlooked by other shelters. “Our Second Chance Animal Trauma Hospital is the busiest trauma hospital that I know of in a shelter setting because we have ambulances that we deploy across the Valley to pick up sick or injured animals,” Hansen said. Last year, the hospital treated more than 11,000 patients. Beyond trauma response, AHS performs 16,000 spays and neuters a year and manages its patients’ healthcare, taking innovative steps to get and keep animals healthy. For instance, its Sunnyslope campus fights the highly contagious, often fatal, viral disease parvo — long been considered untreatable — with the help of a room in the back of the facility transformed into a restricted-access area with its own ventilation, so the disease won’t spread to other dogs. “We’re just over 80 percent successful, which is huge for parvovirus,” Hansen said. AHS’s Bottle Baby ICU cares for tiny felines during kitten season, when shelters are overflowing with kittens. Walter, the World’s Largest VW bus. PACK! Dog walking, working in AHS thrift stores, providing hands-on animal care. There are many ways for animal lovers to make an impact on the local pet community. VISIT AZHUMANE.ORG TO LEARN MORE. Building futures and strengthening communities by pathways building pathways Building futures and strengthening communities by building Building futures and strengthening communities by building pathways successeducation, through education, skill and building and employment. to successtothrough skill building employment. to success through education, skill building and employment. Building futures and strengthening communities by building pathways to success through education, skill building and employment. Denise Resnik dreamed about a future residence for her son Matthew (far right), who was diagnosed with autism 25 years ago. So she researched, raised funds, developed a team and applied a mother’s heart to create First Place AZ. a Global Leadership Institute. Resnik hopes with the creation of First Place Phoenix they will be able to “advance this important work and build a marketplace based on study, data collection and support of public policy.” CREATING A MORE HOPEFUL FUTURE For 27-year-old Matthew the future is bright. He and his parents co-founded SMILE Biscotti (which stands for Supporting My Independent Living Enterprise). The biscotti is sold in the Valley and online. One of the biggest sellers is Peet’s Coffee and Tea at Sky Harbor Terminal 4, where SMILE Biscotti is the second top sales item of all of their passive goods. “It is truly feel-good versus feel sorry for me,” Resnik said. “It’s about what Matt and his co-workers can do, not what they can’t. To see them in action cracking 600 eggs in an hour, packaging, labeling and sealing biscotti — it’s amazing.” A lot of amazing things have happened in the 25 years since Resnik and her husband were told they would have to institutionalize their son. Matthew has the unconditional love of his family, the support of his community, a rewarding job and an exciting new place to live at First Place Phoenix. He is also a mean Scrabble player. Most of all, Matthew is thriving in his life — in his own way. That’s what Resnik wants to see for more children and adults. She remembers sitting in that closet so many years ago, terrified about what would happen to her son. Terrified to come out and face the day. Now she has hope. To learn more, go to firstplaceaz.org. HOSPICE OF THE VALLEY KNOWS THAT PETS ARE GOOD MEDICINE The hair. The smile. The voice. They’re all there, same as you remember. off of pain, and spur communication, including sharing memories of their own pets. Last year, Hospice of the Valley pet therapy teams provided 3,250 hours of service. With each stroke of their coats, these dogs, cats, bunnies — even a miniature horse — helped hospice patients and their families momentarily forget about illness, or at least make it a little easier. “The miniature horse is Lily. She has a tutu and little tennis shoes that she wears if she needs to go where floors might be delicate or she might slip. She’s a big favorite,” Cooney said. Cooney’s association with Hospice of the Valley goes back years. A family member had been cared for by the organization in 2003 and she was blown away. Cooney emceed a couple of events and did stories about the organization being a nonprofit that turns no one away. She always had a soft spot for them, she says. Therapy Teams Wanted You and your best friend can join the menagerie and become a Hospice of the Valley pet therapy team. The organization is specifically in need of small dogs. A great therapy animal is friendly, confident, calm and likes people. All pet teams must be evaluated and registered with a national pet therapy organization. Call (602) 636-6336 or go to hov.org/volunteer/pet-therapy to learn more. Becoming a registered therapy animal takes practice, patience and perseverance, but it can enhance the relationship between the pet and its handler, as it has for Lin Sue Cooney and Max. Hospice of the Valley therapy dog. “She shares my feelings — she really does. I pet her and it makes me feel good.” For Cooney and the care teams at Hospice of the Valley, this is music to their ears. Making end-of-life patients feel good and helping them to embrace the last chapter of their lives is precisely why they serve. “It’s been such a joy to do something that is so needed, valuable and important to every single person,” Cooney said. That’s why, after reporting the Valley’s diverse stories for three decades, Cooney’s mission is now to tell one: Hospice of the Valley’s. The shift has put everything else into perspective. “Somebody cuts you off on the freeway. Your roof has a flood. I’m like, who cares? It is not stage 4 cancer,” Cooney said. The change has also affected how Cooney sees Max. “I see a wise empathy in him,” she said. “When you see him with people who are so weak and happy to see him and he’s so patient — like, more patient than a person would be — I do see him in a different light.” Cooney is leaning across the table in her sunny Hospice of the Valley office, beaming with pride as she talks about Max, the other pet therapy teams, and Hospice of the Valley’s people, programs and plans. As much as she may have enjoyed the limelight that accompanied life in television, she isn’t missing her old gig in the slightest. “To have a career, a calling, a mission — that’s the definition of what I do. I come to work and I’m serving others, and it’s a dream come true,” Cooney said. FEAR: If I use my hospice benefit too soon or don’t time it right, it will run out. LIN SUE: “It doesn’t. You can’t use it up. You have the choice to pursue another treatment and come back.” Cooney encourages people to gather the facts in advance, for themselves or for parents and loved ones. “You can call hospice any time you think you might be eligible and they will send someone out to sit down and talk to you to find out if you are,” she said. In the meantime, Cooney encourages everyone to learn about hospice and give thought to their own final wishes. Visit HOV.org to learn more. years, my wife and I were both working 40 hours a week and carrying a full class load. You develop a work ethic — you don’t have a choice. If you want to survive you learn to work, learn to persevere.” Ingram persevered, graduated debt-free — and went into the working world. 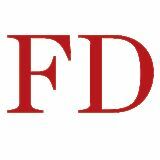 He started at Merck & Company, Inc., one of the world’s largest pharmaceutical companies, where he was the top veterinary pharmaceutical salesman for four years. In 1972, he took the role of president at Tufts & Sons of Oklahoma, Inc., a distributor of animal health and home and garden products, which he grew from a small business into one with $100 million in annual sales. But when the oil and banking crisis of the 1980s hit, the company staggered, and he was forced to sell it at a loss. But Ingram wasn’t done by far. He moved to Arizona in 1987 to start from scratch, founding El Dorado Holdings with a staff of one person at first — himself — and one property south of Phoenix: John Wayne’s El Dorado Ranch. Over the years the company expanded dramatically, building practically the entire city of Maricopa and assets worth more than $1 billion. Mike Ingram joins 12 other exceptional business, civic and cultural leaders from across North America in receiving the Horatio Alger Award. Mike Ingram and his wife Sheila share a philosophy of rising through adversity, staying focused on goals and delivering on commitments. while he’s nowhere near retiring, he does enjoy spending time on the ranch with his six children, 21 grandchildren and 11 great-grandchildren. He also raises cattle and horses as well, which helps explain why he keeps doing what he’s doing. “It’s pretty exciting to see a new baby colt hit the ground, exciting to see a new calf born, exciting to see a new project come to fruition,” he said. “When people retire, sometimes their level of giving back subsides, and they don’t give the way they used to. I don’t want to do that. Besides, my wife would not be happy,” he joked. “She says, ‘I’m happy to have you home for dinner, but I don’t want you home for lunch.’” To learn more about Mike Ingram, the Horatio Alger Association and its member class of 2019, go to horatioalger.org. The Valley’s Highest Quality, Most Reliable, Best Equipped Audio/ Visual Company is also the Best Value in Town Find out what dozens of the Valley’s top events and nonprofits already know — Latest Craze Production goes above and beyond to create an extraordinary AV experience for any occassion. And be sure to ask us about our incredible new LED walls that will make your visuals stand out like never before. The new line of KATCO bags is designed to be organized, so their owners don't have to be. 1	Turn your handbag upside down and dump the contents on an empty table. 2	Take a moment to look through everything and think about which items you really need and which items are there out of habit. 3	Collect like items and put things back in the bag in an order where you can easily reach them. 4	Separate car keys from house keys by having dedicated key rings. 5	Keep the bag orderly so it becomes a habit and you donâ&#x20AC;&#x2122;t waste time reorganizing every day. of profits as well as offer customers the chance to round up their purchases to raise funds for worthy causes as they check out online. The ultimate dream is that the company will help solve problems that women face, both those found inside their bags and in their lives. To learn more, go to katcoleathergoods.com. Frontdoors is proud to recognize those who volunteer their time, treasure and talents to support local organizations in a leadership role. Why do you support UCP of Central Arizona? our world came crashing down. There were incredible moments of pain and sadness as we realized our dreams for our daughter were vanishing before our eyes. Alexandra had already begun services with UCP prior to our diagnosis, and our therapy team was among the first to know of this news. They were there for us as we grieved and wanted to learn as much as possible about her diagnosis of Pitt Hopkins Syndrome. Now over the course of three and a half years, her therapists and the support staff at UCP have offered us a renewed sense of hope for her future. Three times a week, every single week, Alexandra receives therapy to develop critical skills to help her achieve her dreams. I support UCP as a family ambassador, annual donor, volunteer and as a member of their board of directors, so that others can learn about UCP’s critical role in the community. Our family is forever grateful for the incredible therapists that have given Alexandra the gift of hope and cheer her on as she masters every single “inchstone” along the way. and offer a unique glimpse into living life with a disability, while living a life without limits. Guests will have the opportunity to meet Alexandra and Max, my daughter and JoAnn’s son, as well as other children who are defying the odds on a daily basis. While medical journals tell us that our children may never walk or talk, UCP tells us they can and will. Either through a visit to UCP or by attending the event, you will leave with a renewed sense of purpose and hopefully inspired to do more and be more for your community. amazing work for families, children and adults with special needs. They helped my family navigate a very hard path when our son was diagnosed with cerebral palsy at the age of 6 months, and they continue to support Max through triumphs and challenges of everyday life with CP. He has grown to love his therapists as well as the teachers in their inclusive early-learning center. He knows everyone as we walk the UCP campus and they have become like family to us. Favorite movie: JoAnn: Any Harry Potter movie. It was the first “real” book I ever read at the age of 10, and it cultivated my love for reading. The books continued to be released throughout my childhood and I finished the last book when I was 19. I’ve been obsessed with HP for most of my life, so naturally I love the movies. Favorite place to travel: France while in college and will never forget the majestic beauty of the Mediterranean waters, not to mention the fabulous food, shopping and history! I’ve been back since, but never with Alexandra. One day I hope to be able to share other cultures and experiences with her. JoAnn: Puerto Vallarta. The people are friendly and fun, the culture is rich and colorful. Great food, beach and sun. Such a beautiful place! any cause, with my clients knowing they are helping to give back in a very big way, all through the purchase of a T-shirt. JoAnn: I’m passionate about sharing what life is like for kids like my son Max. One of my main goals is to ensure that the people around him know exactly who he is and that he is so much more than a diagnosis. CP is a small part of who he is. I use my voice to educate and advocate for my son and others in the special-needs community. To Nominate Your Event Chair, Co-Chairs, Honorary Chair or Board Chair, Contact Jill@FrontdoorsMedia.com. Karma, the kitten that provided inspiration for the Fearless Kitty logo, has found a forever home, but her spirit continues to motivate everyone at Fearless Kitty Rescue. Fearless Kitty rescues cats in distress without regard to age, breed or ease of placement. are key components of the organization and what’s needed for Fearless Kitty to be here 20 years down the road,” said Stefan. As Fearless Kitty Rescue continues to expand and build on their success, they hope to one day shift focus. “We would like to be out of business as a rescue,” said Stefan. “We would like to have a different purpose — it wouldn’t be about how many calls we’re going to get this month of how many animals need our help. “ But until then, Fearless Kitty Rescue will charge forward, doing what they can to help the homeless cats and hopeful humans in the community — one fearless kitty at a time. To learn more, visit fearlesskittyrescue.org. KITTY CAM! Want to know what it’s like to be a cat at Kittyville? Get a look inside the lives of adoptable residents with the help of the Live Kitty Cam donated by Maddie’s Fund. Peek in on playtime, nap-time and even tune in for scheduled activities and informative talks. AZ FINE SWINE Mesa and Gilbert | azfineswine.com Located on an expansive farm in Mesa, a fifth-generation Arizona farm family works hard raising around 250 hairy sheep-like Mangalitsa pigs. What’s so special about the Mangalitsa? Hailed by many as the world’s finest pork, the tender meat is prized by famous chefs and home chefs alike for its rich and buttery taste. Mangalitsa pork is red and marbled like a rib-eye steak. Translated, Mangalitsa literally means “a hog with a lot of lard.” Their fat compares to olive oil and is high in omegas (good fats). So where can you try or purchase some of this wonderful pork? Several local restaurants feature AZ Fine Swine’s pork on their menu such as Arizona Wilderness Brewing Co. To purchase Mangalitsa pork, head out to the Gilbert Farmer’s Market (AZ Fine Swine does not have a retail location). They are there every Saturday with more than 25 different items to choose from. I picked up some of their chorizo and bacon and it was truly the best pork I’ve ever tasted. AZ Fine Swine’s hogs are humanely raised with no hormones or antibiotics and the pigs are processed (every part of the pig) and packaged by a local company. WELCOME DINER Phoenix | welcomediner.net Welcome Diner is located in Downtown Phoenix, nestled in the heart of the Garfield neighborhood. The restaurant is a modern take on the classic roadside diner with a cool vibe, friendly staff and top-notch food and drink. Welcome Diner prides itself on being a farm-to-table eatery, partnering with several local purveyors and farms. My family and I recently stopped in for dinner on a Friday night. We started with drinks, all adorably served in different glassware. The kids had their fruit punch, which is freshly made, and my husband and I each ordered a cocktail. Our Prancing Pony and Old Fashioned were both good; overall their drink menu is unique and fun. We asked the waitress for recommendations and she was on the money. I had a dish that made them famous: their chorizo meatloaf. The taste was rich and spicy and like no other meatloaf I’ve eaten before. My husband ordered the delicious Big Jim, a fried chicken biscuit topped with country gravy, cheddar cheese, bacon and an egg. Our boys shared the spicy Mac and Cheese with chorizo. We passed a lot of forks around the table during our visit and left full. FÀME CAFFE Phoenix | famephx.com Fàme Caffe is a charming restaurant that serves breakfast and lunch seven days a week. Their classically trained chef uses high-quality, locally sourced ingredients across their menu. Fàme also has a full bar with a cocktail and wine menu and several beers on tap. I met my parents for breakfast early on a Saturday and there was a line out the door. We each ordered something different so we could share and try several of Fàme’s dishes. I had a vanilla latte while my dad had orange juice, which tasted as if the oranges had just been plucked from the tree. My mom ordered a Coke, which came in a glass bottle. The food arrived and we dug in. I had the Croque Madame, a French sandwich with smoked ham, bèchamel sauce, on toasted nine-grain bread, topped with melted Gruyère cheese and an egg (I ordered mine over-hard), served with a side of mixed greens tossed in a light vinaigrette. My mom had a chorizo, potato and egg breakfast wrap and my dad tried their brioche breakfast sandwich with egg, bacon and aged cheddar cheese. Next time, I’ll visit for lunch and try some of their house-made sangria. of â&#x20AC;&#x2DC;freshâ&#x20AC;&#x2122; into perspective. Milk taken from cows the night before would be processed, bottled and shipped out the day I was there. This happens four days a week to the tune of 8,000-10,000 bottles per week, just for their milk. They also produce butter, cream and seasonal favorites like eggnog, and partner with other local companies to bottle orange juice and lemonade. I often purchase their milk and prefer to use their heavy whipping cream for recipes. Danzeisen Dairy will be celebrating their fifth anniversary this November and will release a commemorative bottle design to mark the occasion. Visit their website to learn where to locate their product or to sign up for dairy tours and butter-making classes. nightmares. “We’ve had more than one veteran tell us they were considering suicide. They wouldn’t be here today, they say, if it weren’t for our program and their dog,” Meir said. The organization finds dogs at Valley shelters and rescue partners. A careful process ensues before the new BFFs are ever introduced to their veterans. Each dog is given a physical exam, all health needs are taken care of, and those over 40 pounds are X-rayed for hip dysplasia. Then they’re fostered for two to four weeks to be assessed outside the shelter environment. They also start some basic obedience with the organization’s trainers, and are then placed in their new loving forever home. “This program is for PTSD and TBI only, but the severity of issues varies greatly,” Meir said. “The dogs learn three tasks to use each time they sense their veteran is having symptoms. The teams — what we call the dog/veteran combination — work with a trainer in public outings, for a total of nine times during their training. The team is tested on each skill.” The average training takes six to nine months, but some may finish sooner and others may take a little longer, particularly those with TBI. And there is no “training schedule” per se. Teams go into training all the time. Each is required to do a private lesson and a group class every week. By pairing veterans with combat-related PTSD or TBI with service dogs, Soldierâ&#x20AC;&#x2122;s Best Friend touches two lives at once. The groups are comprised of four or five teams, plus the trainer. The added distractions of additional people and dogs simulate what the teams will encounter in everyday life. “Soldier’s Best Friend only trains teams in Arizona,” Meir said. “But if a veteran is able to relocate for the duration of the program, we’ll welcome them.” And the stories she’s witnessed are truly amazing. “Vets tell me all the time that they’re able to do so many things they couldn’t before the program. One talked about being able to take his teenage daughter to the mall — crowds had been difficult for him. In February, another told me he had already been to the grocery store five times this year. Last year, before he’d met his new best friend, he’d only been able to go once,” Meir said. Soldier’s Best Friend has training locations in Flagstaff, Prescott, Tucson, Sierra Vista and Phoenix. The program is completely free to veterans, and the organization is limited only by its capacity, which is something it wants to strengthen. “So, like any nonprofit, we want to raise public awareness and funds,” Meir said. Since 2011, 257 teams have graduated from Soldier’s Best Friend. That’s 514 lives — canine and human — that have been given second acts. Ric, who graduated in 2014 with his canine friend Wilfred, is a shining example. “From the restless nights to the difficult situations, I have something that has been an elusive possibility … I have hope again,” he said. To learn more, visit soldiersbestfriend.org. Classic ranch style home located on the one and only palm tree lined Hazelwood Street of Arcadia! Masterfully rebuilt in 2007 by Bent Nails Construction. True split master floor plan with 4 bedrooms, 3 bathrooms and 2300 sq ft. Brazilian cherry wood floors, crown molding, wainscoting and granite countertops. The gorgeous kitchen sports a breakfast bar, gas cooktop, stainless steel appliances and opens to the family room with multiple sets of French doors leading out to spacious backyard. The master suite includes a gas fireplace, access to backyard, separate tub and walk-in shower, double sinks and his and hers closets. Private backyard with tons of grass for play. Just across 40th street from LGO, Postinoâ&#x20AC;&#x2122;s and Ingoâ&#x20AC;&#x2122;s and around the corner from Kachina Park! Highly sought after Hopi, Ingleside, Arcadia School District! Exceptional Mid Century Red Brick Ranch style home on a wonderful street in the Heart of the North Central Corridor! 4 bedrooms + den, 4 full bathrooms, 3467 sq. ft. on 15,651 sq. ft. lot. Spacious grassy front yard with mature trees. Wood plank flooring and custom shutters. Updated kitchen with stainless steel appliances, 5 burner gas stovetop, warming drawer and walk-in pantry. Family room has original vaulted ceiling, Coconino sandstone fireplace and sliding doors with access to back covered patio. Very versatile floor plan. Backyard designed by Creative Environments 2018 includes covered patio, separate Ramada with built-in BBQ, firepit, swimming pool and designated dog run. Freshly painted exterior trim and interior garage. Madison Schools! Close to all that North Central Phoenix has to offer. This house is a must see! One of my intentions this season has been to attend events posted on the Frontdoors Calendar that are being hosted by organizations that are new to me. This past December, Lost Our Home Pet Rescue posted their annual “Sit. Stay. Brunch.” event to our website and I was excited to go and learn more about their efforts. What I discovered was an incredible story of kindness and determination. During the economic downturn of 2008, Jodi Polanski was a mortgage banker who found out about a disturbing trend in her community. She kept getting calls from her network of realtors asking if she knew what to do when they discovered a pet had been left behind by the owners of a foreclosed home. These animals were being left for days and weeks before being discovered by someone coming to check on the home or by the local police after a neighbor called to report the abandoned pet. So Polanski and her colleagues went to work to help these forgotten animals. They organized a network of friends, business associates and family members to become foster families for each animal that was left behind. Eviction, foreclosure, fires, floods … all can force people and pets into unknown territory. Lost Our Home helps in trying times by caring for pets, easing some of the pressure on pet owners. hit their goal of $2.4 million and will need more foster homes in the East Valley to continue their services while the building is under construction. A generous Arizona resident has established a $100,000 challenge grant to close the funding gap for the building campaign. When completed, they will be able to continue their role as the drop-off location for the Tempe Police Department and also add this service for the Mesa Police as well. My take on this story? Polanski is a problemsolver and Tempe’s own guardian pet angel for not only the pets that are sometimes left behind, but the loving pet owners facing hard times. For more information, visit lostourhome.org. Lin Sue and the Power of the Paw + Chicanos Por La Causa + Arizona Humane Society + Soldier’s Best Friend and more!